I have had skin issues since… well.. forever. At lest since puberty hit. And that was, eh hem, a few years ago. As a teen I HATED my skin. I used creams, went to the dermatologist, but nothing really worked. Looking back my skin was not the worst it could be, but I was never without pimples. This can really have an impact on a person’s self esteem. 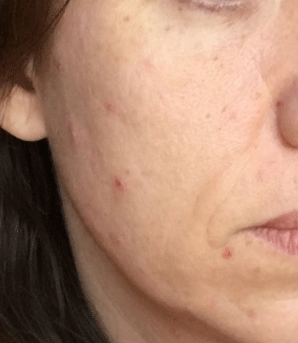 Over the years I had always thought it would get better… I mean, what adult has bad skin? Who wants to be battling aging skin AND zits??? In all honesty, over the years my skin has improved. The pimples are generally smaller and easier to cover up than those from my teens. But I still can not seem to get rid of them. 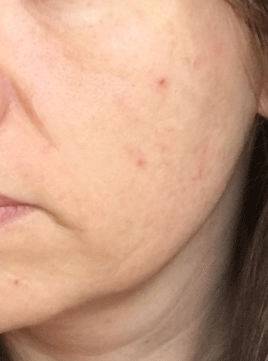 I’ve tried a lot of things to improve my skin, diet changes (no gluten, no dairy…) and while I am much better off overall for many of those lifestyle changes it still had little impact on my skin. I have tried essential oils, cleansers and probably the thing that had the greatest recent change was using green tea extract (you can see the post here). The green tea extract worked for me. It cut down the zits a considerable amount. But I do tend to find that somehow my skin seems to adjust and products become less effective for me over time. So, back to the drawing board (or Google). I was recently doing some research and came across a company call Curology. It’s a company that will evaluate your skin issues (through a questionnaire you fill and out photos) and send you “custom” skin creme. They also will assign you a Curology medical provider that you can email questions to. 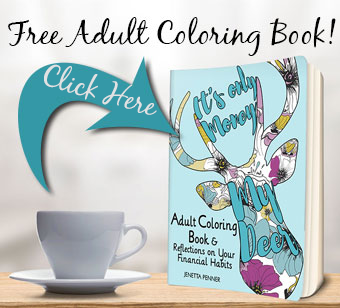 The cost is $19.95 a month (but you can get your 1st month free here). Which in my opinion really isn’t a bad deal if it works. My co pay just to see a dermatologist is that much and doesn’t include the medication. So I ordered it (heck… one month is free, why not give it a try?). What I like about Curology is that they will change it for you if it is not working. I was told in the future they may add retinoin to my formula for even more help with fine lines, skin texture, and firmness (yeah for less lines and zits!). Like I said above, sometimes a product will work amazing for a month or 2 and then not so much. I’ve been using Curology for a week now and so far so good. There has been a little dryness on my cheeks (where the pimples are healing) and possibly a tiny bit of oiliness on my forehead. I’ve had no major breakouts since I started using it. But it’s hard to know if that is the medication or just ups and downs of my skin. To give you an idea of how my skin is with out makeup, here are two photos. This really isn’t even that bad (sometimes it’s worse, but like I mentioned above the situation has improved with the green tea extract). These were taken to send to Curology. 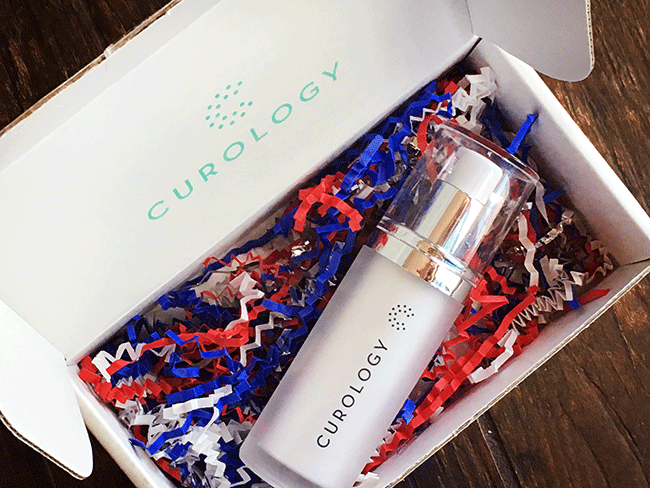 If you want to try Curology you will get your first month free through this link. Since they send you a three month supply of medication I was a bit confused to how the free month worked. I had a concern that if I did not like the product I would still need to pay for month 2 and 3 if I canceled. But I asked them and this is NOT the case. If you happen to cancel at month 1 you keep the medication and do not pay for month 2 and 3. Also, as an added bonus, if you continue month 2 and 3 and are not satisfied there is a 90 day money back guarantee. Curology regards themselves as a whole service, not just the medication. So you are paying for your medical provider and being able to contact them at anytime with questions or to change your medication. If you run out of medication prior to month 3 they will even send you more medication at no additional charge. Let me know your story (so I know I’m not alone!) and if you might try Curology. And I will will try to keep you all updated on my progress. Click here to get your first month of Curology (and a 90 day supply of medication) for free.